Foundry with history - Roučka slévárna, a.s.
Erich Roučka, a distinguished engineer and inventor, was born on 30 October 1888 in Velké Meziříčí as the fifth of six children of master builder Václav Roučka. After graduating from the grammar school in his hometown, he completed four years of study at the German State Engineering School in Brno. He found interest in technical models and physical experiments in youth. He constructed a simple ammeter when he was ten years old, a brass furnace four years later, and at seventeen, he built an accumulator, an electric motor and a control board with measuring instruments. 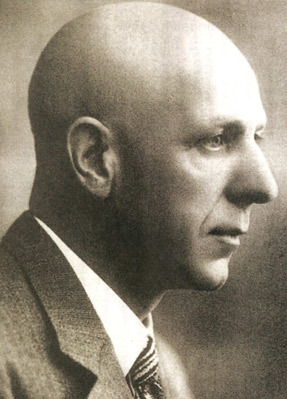 In 1911, Erich Roučka came to Blansko and founded a factory producing electrical measuring instruments, the first in the Austria-Hungary, and Central Europe as such. Precise and quickly delivered instruments were sold very well and the mark “ER” (Erich Roučka) became well-known all over Austria-Hungary. Roučka's products were supplied to military ships during World War I (1914–1918) where the instruments easily withstood shocks caused by gunfire. During the war, Erich married Zdeňka Hábová, a teacher, who gave birth to three children: son Erich and twins Zdeněk and Jarmila. Unfortunately, the wedlock was divorced in 1929. He went to the United States in 1919 where he met with Thomas Alva Edison to consult ideas with him. After returning to Blansko in 1921, he began manufacturing automatic regulators for steam boilers, named E.R. Robot by courtesy of Karel Čapek. Roučka founded a boiler company with foundry in Brno-Slatina in 1929. An electric-arc furnace for the production of cast steel was put in operation in the foundry in 1938, and a new foundry was constructed in the factory between 1938 and 1940. The foundry was forced to supply castings to the German army during World War II (1939–1945), and suffered substantial damage during bombing. Erich Roučka remarried after the war, this time his laboratory technician and housekeeper, Anežka Venutová. All plans for further development of the factory ended by nationalisation in 1948. Roučka lost almost everything overnight, he was given a ridiculously low pension and was unable to find work elsewhere until 1952 when he was offered a job in the Energy Research Institute in Brno. Roučka decided to emigrate in 1959. He went to Germany and was employed by AEG where he worked for another 8 years. Erich Roučka owned around 850 certified patents, primarily in the area of technology, but also in medicine. As early as 1937, he published a book on the theory of evelopment of cancer due to malnutrition. In addition, he constructed a functional model of the heart and blood circulation, patented in 1950. He also tried to build a polygraph, and at ninety, he designed an instrument for measuring the geopathogenic zones. He was given the engineer's degree although he never graduated from any university. He was awarded a number of medals, prizes and acknowledgements, and he was ahead of his time in many cases. Erich Roučka died on 16 March 1986 in Ezelsdorf, Germany, at the venerable age of 98 years. 1992 privatization of the establishment into the join stock company ROUČKA-SLATINA, a.s.
1999 sale of 100 per cent of the shares to the subsidiary company ROUČKA-SERVIS, a.s.
2000 change of the company name into ROUČKA SLÉVÁRNA, a.s.